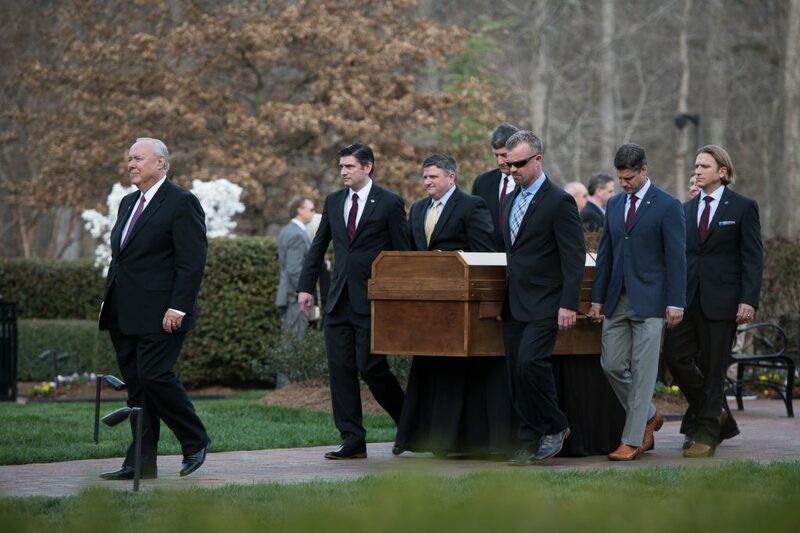 Billy Graham's grandsons, including Will Graham (pictured at the front of the casket in a red necktie) are serving as pallbearers. On Saturday, six of the 12 grandsons carried Mr. Graham into the Billy Graham Library for a private family ceremony. 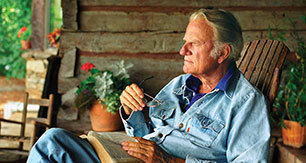 Billy Graham will lie in repose on Monday & Tuesday in Charlotte. This event is open to the public. Plan your visit. Sunshine spilled from once overcast skies on Saturday as the black hearse carrying Billy Graham rolled to a stop in front of the Billy Graham Library. The 14-car motorcade had just traveled 130 miles of North Carolina roads from the Billy Graham Training Center at The Cove in Asheville to the Library in Mr. Graham’s hometown of Charlotte. It was a relatively short trip for a man who once spent decades canvassing the globe, sharing the hope of Jesus Christ. And yet the evident impact of his life in that short three-and-a-half-hour trip was humbling. Along the processional route, even up to the gate of the Billy Graham Evangelistic Association, people parked their cars and stood. Some waved Bibles, American flags or just their hand to say goodbye. Standing outside the Library, Leighton Ford’s eyes shone under the unseasonably warm February sun. He couldn’t help but be struck by what his brother-in-law would think of the outpouring for the motorcade. “This farm boy who grew up on the red clay just five miles from here, his mouth would probably drop open,” said Ford, an evangelist and author. “He’d say, ‘It’s too much about me.’ But he’d appreciate it. He’d be grateful for it. 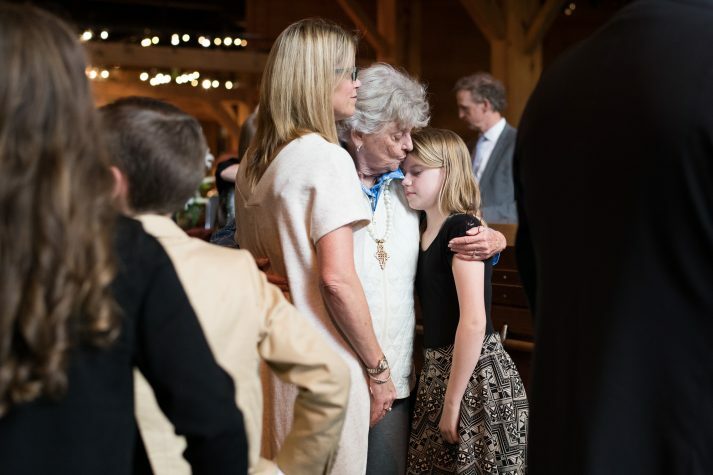 Jean Graham Ford, Billy Graham’s little sister, gives her granddaughter a hug in the Billy Graham Library, where a private family ceremony was held on Saturday afternoon. Ford greeted Franklin Graham and other close relatives after they exited the motorcade. Family members hugged, and the pallbearers—Mr. Graham’s grandsons—got into position. Will Graham, along with his brother, Roy, and cousins, carefully lifted Mr. Graham’s simple, handmade casket out of the hearse. They walked slowly, but not sorrowfully, toward the Library for the private family ceremony that was held in the lobby. A cross shaped of white lilies, an arrangement Billy and Ruth Graham often sent for funerals, sat near the casket. Ken Barun, executive vice president of the Billy Graham Evangelistic Association, echoed that sentiment on Saturday. “His life touched everyone,” said Barun, noting his once-orthodox Jewish father made a point of watching Mr. Graham every week on television. His father would later accept Christ. 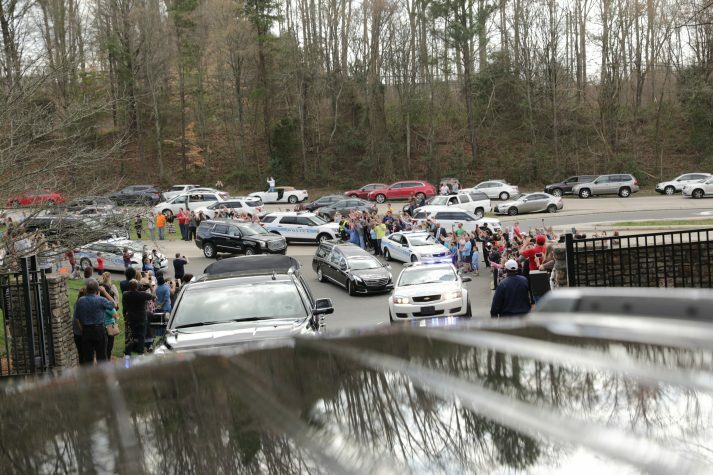 People waved and some captured the moment with their phones as the motorcade pulled off Billy Graham Parkway and into the Billy Graham Evangelistic Association headquarters in Charlotte, North Carolina..
Members of the public will have another opportunity to pay their respects starting Monday, February 26. Mr. Graham will lie in repose at the Billy Graham Homeplace on the grounds of the Billy Graham Library on Monday and Tuesday. On Wednesday, he will lie in honor at the U.S. Capitol Rotunda in Washington, D.C. A private funeral service will be held Friday in Charlotte, where Mr. Graham will be buried beside his wife Ruth in the Prayer Garden of the Billy Graham Library. Just a short walk from that Prayer Garden, Ford contemplated Mr. Graham’s legacy on Saturday. Birds chirped and white flowering trees danced in the breeze as Ford shared how Mr. Graham once told him he just wanted to be remembered for preaching the Gospel.